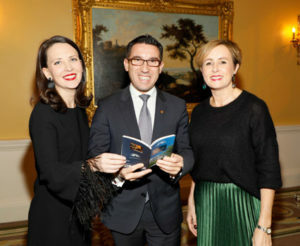 Ireland’s Blue Book, a collection of country house hotels, manor houses, castles and restaurants located throughout the island of Ireland, has added six properties at the launch of its 45th Anniversary Edition. Ballyfin Demesne Co. Laois, Bishop’s Gate Hotel Derry, Cahernane House, Killarney, Co Kerry and Butler House, Kilkenny City were revealed as new members. Two private rental properties were also unveiled, Dunowen House in West Cork, the former home of Noel Redding, who was a bassist with the Jimi Hendrix Experience, and The Hideaway at Dromquinna Manor, Co Kerry bringing to 56 the total of properties in the collection. The announcement of the new additions was made at reception in The Merrion Hotel in Dublin to celebrate 45 years since the collection was founded in 1974.